Who remembers Sara Amat these days? She was barely thirteen when one summer night, playing hide and seek with her friends, she disappeared and was never heard about again. All that remained was a news article in the local Terrassa newspaper, rumours and speculation. However, Pep de Cal Sabater, the narrator of this story, does remember her. That night, he says, Sara didn’t disappear but slipped into her home through the back door. She may not have hidden for very long but sometimes the memory of an event lasts a lifetime and even lends it meaning. Written many years after the fact, Life Without Sara Amat is a confessional account of unforgettable events, a few days in the life of a village in summer, an obedient and easily seduced boy and a girl who was no longer a girl driven by a ferocious, urgent desire to flee, even if it was just through the back door. 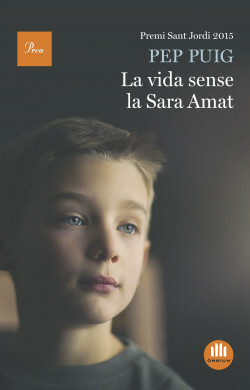 With Life Without Sara Amat, readers can enjoy the development of a great literary talent and a story that moved the jury of the most recent Sant Jordi prize.